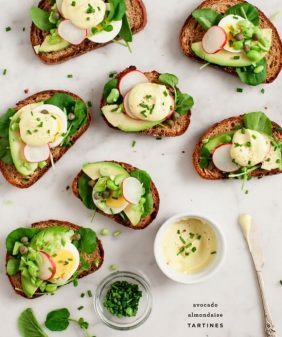 Fresh spring toasts topped with zesty edamame hummus and lemony yogurt dip. It’s been snack time around here lately. 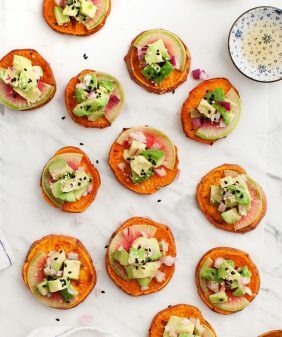 I don’t know if it’s because spring is in the air, or because our schedules have been irregular lately, but we seem to have traded regular meals for snacky meals. Here are two variations that we’ve recently called dinner… best served with wine and maybe a light soup or salad. The snacking continued with the leftovers. The next morning I baked a tortilla until crispy, and topped it with edamame hummus and a fried egg. (New discovery: the breakfast tostada). The rest of the yogurt sauce went on a salad with chopped veggies. 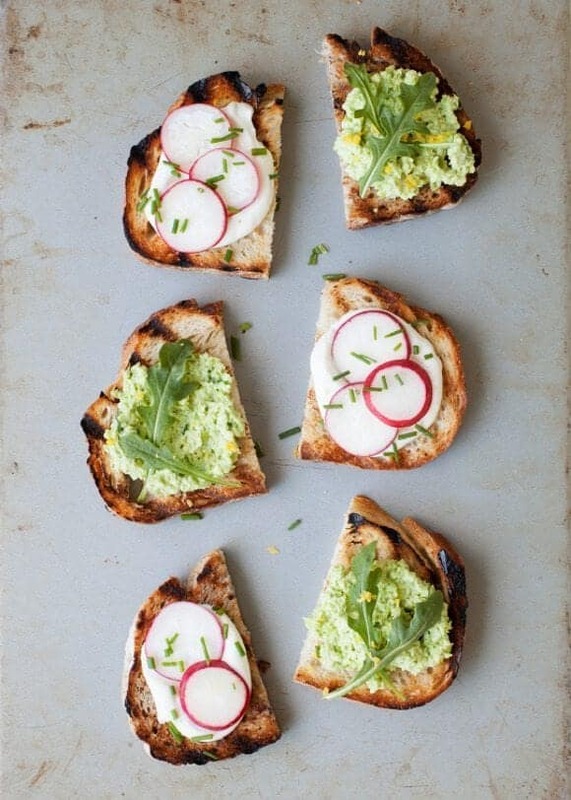 Grilled Garlic Toasts:Brush olive oil on bread slices. Grill on both sides until lightly charred. Remove and rub slices with the cut side of ½ a garlic clove while bread is still hot. Top with above toppings. Looks delicious!! 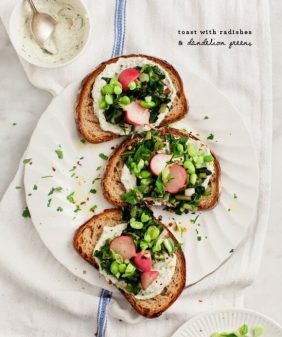 Can’t wait to try the edamame hummus, perhaps as a spring picnic meal! 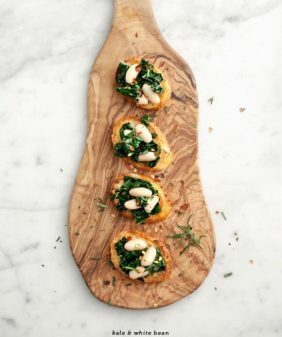 This would be a perfect dish in a tapas meal! I love what a simple and beautiful snack this is. I love treats like this. 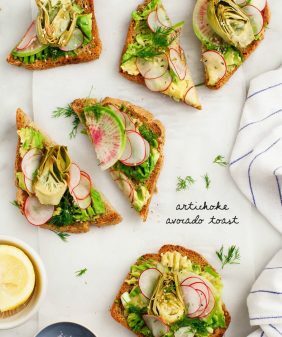 Lately I have been enjoying toast with just a little mashed up avocado, some red pepper flakes and a little squeeze of lime. that’s my go-to too 🙂 avocado, lemon & salt. Ohhh, I like the idea of a hummus breakfast tostada, with a bit runny egg. Gorg. 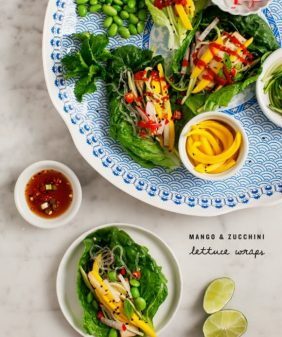 Lovely spring meal and definitely a great way to use the leftoveres! Hummus is huge in our house, we use it pretty much as our number one condiment, but I’ve never heard of Edamame hummus. Sounds delicious. I will have to add this to our rotating list of different hummus’. Can’t wait to give it a shot. beautiful presentation of such a lovely recipe. Why have I never thought of edamame hummus? Yum!